Happy first Bulu Box (weight loss variety) to me! I absolutely love subscription boxes, bags and services. Honestly they are such a great way to try out new products and keep it affordable. As I was reading around some blogs I came across a post about a Bulu box and decided to subscribe. 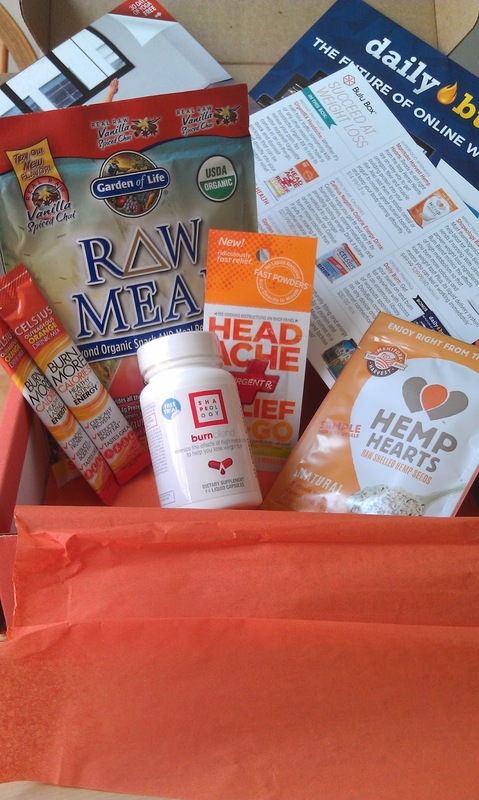 Bulu box is a subscription service all about health, weight loss and nutrition products. Many of you know, I'm sure, how expensive trying new supplements and nutrition products can be so with a price tag of $10 a month Bulu makes this process a lot easier and a lot less expensive. Here's what I found in my August Bulu Weight Loss Box (you can also choose the Bulu Box which is not a weight loss option). I decided to have this for breakfast today, and was pleasantly surprised. I tend to think these meal replacements can be really chalky in texture, but Raw Organic Meal was not among those. For prep I decided to go with just mixing the packet with 16 oz of water, by stirring with a spoon. Next time I would use a blender or a blender cup a spoon is not sufficient. The color was a little grey and off-putting but the taste was really good. I'm torn on these, but maybe it's because I just tried them alone. The Hemp Hearts are really nutty and I like the texture. I keep thinking about how great they would be in a banana nut concoction. Though nutty they also have moist component to them and a pretty nice flavor. They suggest you sprinkle on cereal or yogurt or simply eat them alone. I like them...but I'm not committed to them just yet. I went into trying this with a pretty good idea that I'd hate the taste of it. I do not hate it. I've tried a lot of these and usually can't get past the after taste but this one really doesn't have one. It reminds me of tang, so if you are alright with an artificial orange flavor you might want to give this one a try. As for the energy boost claims, I'm not sold on those. I don't feel that it made a difference, at least not for me. I haven't tried this yet, and might not get to. I don't often suffer from headaches. The product does promise to dissolve instantly and provide instant relief. Let me know if you've tried this and like it. Burn Blend is created to mimic the effects of a high metabolism. I'm pretty sure I don't have a hight metabolism, but what I noticed on my second day using this (1 pill in the morning and 1 in the afternoon) was a noted increase in energy around the afternoon. I haven't signed up yet but the Daily Burn promises to have workout videos accessible on any device anywhere there is internet which would come in hand when traveling...which I do enough. I'll be sure to check it out and hopefully love it. That's my first month of Bulu Weight Loss Box. I'm excited to have gotten to try some new products and I look forward to seeing what comes next month! If you want to sign up for a mere $10 a month I think yo should! Sign up now. If you use the links in this post to sign up, I will get credit for having referred you to the site. I like Bulu Box a lot! What a great idea! I love that they put so many items in it, and don;t skimp like some other subscriptions boxes do. Such healthy products! It's a great way to "treat" yourself and give yourself encouragement when trying to loose weight! I just got my first box this weekend! Really like what I got! Sounds like a great deal for the price to me. I love all the healthy products included.